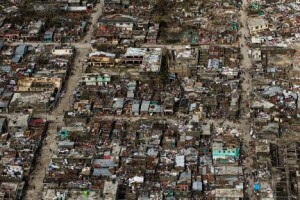 PORT AU PRINCE - One week after Hurricane Matthew slammed into Haiti, more than 100,000 children are missing out on learning as their schools were either damaged or converted into shelters, the United Nations Children's Fund (UNICEF) reported on Tuesday, stressing the urgent need to rehabilitate those facilities. Meanwhile, on Monday, the ministry of agriculture, natural resources and rural development (MARNDR) released a first partial report of extensive damage caused by Hurricane Matthew in the agricultural sector. Schools across the country are reopening but, according to initial national estimates, at least 300 public schools have been partially or entirely damaged in the country and many others are being used to shelter displaced families. Schools in Sud and Grande Anse departments will remain closed for at least another week. UNICEF is working with partners to help set up temporary learning spaces. Priorities include rehabilitating damaged schools, delivering adequate school supplies, furniture and teaching materials, and providing children with psychosocial support. The ministry of agriculture released a preliminary report detailing hundreds of thousands of metric tons of production losses due to the hurricane and the loss of hundreds of thousands of livestock, as well as damaged or destroyed fishing boats and equipment, processing buildings, irrigation systems and farm roads.